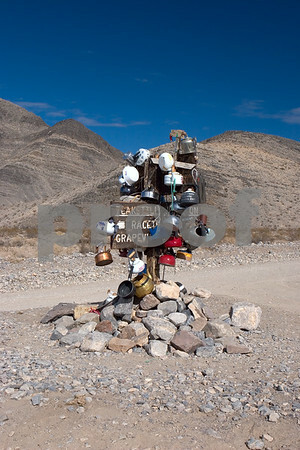 TeaKettle Junction in Death Valley National Park. This signpost marks the intersection of Racetrack Road and Hidden Valley Road. Travelers leave customized teakettles to mark their passing. The rangers periodically remove the kettles, so the collection is always evolving.